Triplex mud pumps and triplex mud pump parts are our specialty. We supply the most popular triplex mud pumps in the industry, which have excellent quality and competitive prices. Our triplex mud pumps are interchangeable with the popular OEM. All of our triplex mud pumps and triplex mud pump parts meet the industry standards established by the American Petroleum Institute (API). 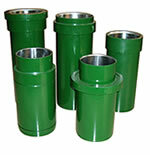 As a global supplier of quality oilfield equipment to the oil and gas industry, we ship our products around the world. Besides triplex mud pumps and triplex mud pump parts, we supply drilling rigs, workover rigs, top drives, drilling equipment, blowout preventers, BOP control systems, choke and kill manifolds, well service pumps for well cementing and hydraulic fracturing, wellhead equipment, casing heads, tubing heads, X-mas trees, FC type gate valves, etc. Please visit our company website or download our comprehensive catalog to see our full line of products. We supply unitized mud pump packages driven by DC or AC electric motors or diesel engines for electric and mechanical drilling rigs. The client can select DC or AC motors and diesel engine brands such as Caterpillar, Detroit, Cummins or others. 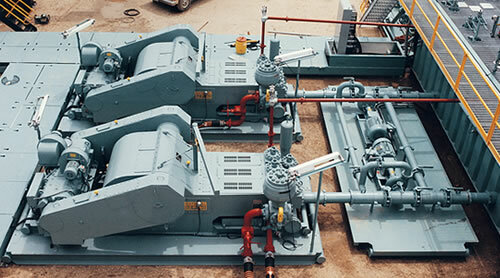 Our unitized mud pump packages including everything on the skid and usually they are ready to work at delivery. Our headquarters are located in the energy capital Houston, USA and we ship our products around the world. One important thing about us is that our prices are very competitive and our delivery time is short.